"Geo. 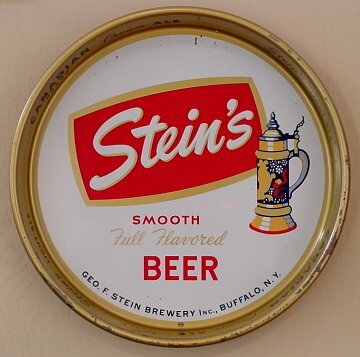 F. Stein Brewery, Inc., Buffalo, N.Y."
"Stein's Light Ale - Canadian Brand Cream Ale"
Geo. F. Stein Brewery, Inc.
Buffalo, New York Comments: A real early eBay pick-up, for dirt. This tray is not all that common. I think I have seen two since 1997 when I saw this one. A pretty bland tray.